From the groundbreaking partnership of Macmillan Learning and Scientific American comes this one-of-a-kind introduction to the science of biology and its impact on the way we live. 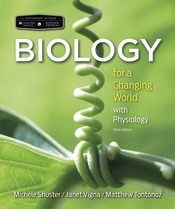 In Biology for a Changing World, two experienced educators and a science journalist explore the core ideas of biology through chapters written and illustrated in the style of a Scientific American article. Chapters don’t just feature compelling stories of real people—each chapter is a newsworthy story that serves as a context for covering the standard curriculum for the non-majors biology course. Updated throughout, the new edition offers new stories, enhanced plant and diversity coverage, and an expanded media program. Biology for a Changing World is supported by its own dedicated version of LaunchPad—Macmillan’s breakthrough online course space which fully integrates an interactive e-Book, all student media, a wide range of assessment and course management feature.